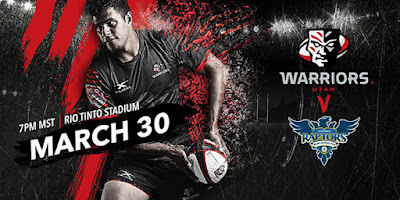 The Utah Warriors played in their first preseason match against Glendale. The first matchup of a potential natural rivalry. Utah's physical style of play seem to meet its match with Glendale's continuity. We can see the difference between a team that has been together for about two years and a team that has been together for two months. The Warriors got the scoring started almost immediately. After a lineout they worked the ball wide and Ben Nicholls scored near the posts after an offload from Jared Whippy. After Angus Maclellan was sent to the sin bin in the eighth minute for repeated infringement, the Warriors defense was tested. Glendale had multiple opportunities with a scrum from Utah's five meter line, but eventually the Warriors were able to turn the ball over and clear their line. Glendale was eventually able to take advantage of the yellow card. After another opportunity for the Raptors, the Warriors were able to clear the ball. But that ball fell into the Raptors hands and the ball got wide to Mika Kruse who was able to break an ankle tackle and dot down the 40 meter try to give the Raptors the lead. The Warriors were again down to 14 men after Kory Olsen was given a yellow card. Utah looked to take the lead back after a line break from Alex Tucci. But the Raptors were able to turn the ball over and John Ryberg was able to dot down to extend the Raptors lead. Jared Whippy had a chance to cut into the Raptors lead but his penalty kick was just wide. Utah had a couple of injuries in the first half as Jackson Kaka went down with a shoulder injury and Arawa Elkington looked to go down with a concussion. John Quill extended the Raptors lead. After Mika Kruse drug a couple players towards the try line, he was dragged down just short and Shaun Davies was able to get the pass to Quill who walked in for the try. The Warriors were able to get on the board at the stroke of halftime. Josh Whippy had an excellent line break and was able to gain over 50 meters before the Raptors were able to bring him down. Utah was able to put together a couple phases before Lance Williams was able to get over the line for the try to make the halftime score 21-10 in favor of the Raptors. Maximo de Achaval got the scoring started in the second half. After a couple nice phases from the Raptors, John Quill was able to offload down the short side to de Achaval who was clear in for the try. Utah lost a lot of opportunities in this match. One Warrior would get a line break but he would have no support with him and the Raptors would hold him up and get the turnover. Sometimes the Warriors had too many and this caused their offense to stagnate. Maximo de Achaval got his second try of the match. After a 20 minute lull in the scoring, de Achaval once again was able to score down the short side. The Warriors gave the Raptors a good physical test, but the Raptors were able to execute better. Utah was finally able to answer Glendale. Jared Whippy offloaded to Josh Whippy, who offloaded to Josh Anderson for the try. The Raptors had a hold of Josh Anderson and were looking to drag him over the touch line, but Anderson was able to dot down just before he went over. Glendale eight man Peter Dahl was given a yellow card for a high tackle. This caused Glendale to finish the game down a man. Glendale wasn't able to put the match away as they had a number of handling errors late in the game. And just to prove me wrong, Will Magie added to the Raptors lead. After earning a scrum, Magie was able to take the ball and dodge a number of tackles to dot down for the try. This was the first match of the year for the Warriors and it showed. They just aren't a cohesive unit yet. Glendale still has a few minor things to work on, but their cohesiveness as a unit will serve them well this inaugural Major League Rugby season. The Warriors will start coming together as a team as the season goes on. The Warriors will head back to the film room and find things to improve on. They will host the Ontario Arrows next Friday, April 6th. This match will also be at Rio Tinto Stadium as the finishing touches are put on Zions Bank Stadium. Glendale will play their final preseason match next Saturday, April 7th as they travel to New York to take on New York Athletic Club.